‘Heronfield is a beautifully appointed, large centrally heated modern home set in a small private secluded development just one mile from Portree village centre. 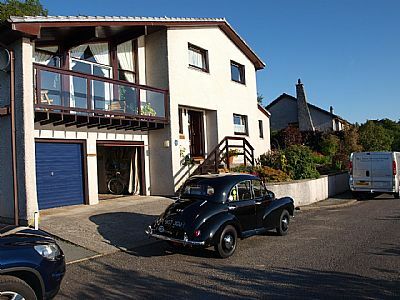 It is positioned to enjoy spectacular panoramic mountain and sea views across Portree bay eastwards towards the Island of Raasay and the mainland of Scotland beyond including (on fine days) the southern parts of the Torridon Mountains in Wester Ross. As such ‘Heronfield’ is ideally suited for all local amenities to be found in Skye’s largest village, Portree; including Banks, Fuel Stations, Shops and of course a variety of restaurants. Since Portree is centrally situated in Skye it makes an ideal base from which to explore the entire Island without the necessity to move base during your stay.